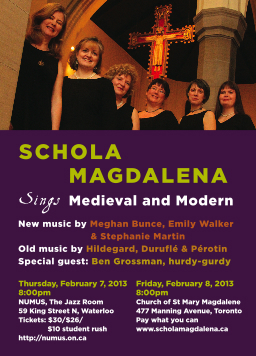 Schola Magdalena presents a candlelit evening of exquisite music, new and old, for women’s voices. Along with medieval plainchant, early polyphony, and the music of Hildegard of Bingen, the group is pleased to present new music, including Stephanie Martin’s “Missa Lumen” and commissioned works by Canadian composers Emily Walker and Meghan Bunce. Walker’s delicate and serene setting of “Ubi Caritas” and Bunce’s mysterious and exciting “Hai Alla Al Walah,” based on a Baha’i text, have been composed for Schola Magdalena’s performance with NUMUS Concerts, a series in Waterloo dedicated to presenting “the bold sounds and ideas of a new generation of composers and performers while celebrating the innovators of the past.” Ben Grossman, hurdy-gurdy, will join Schola Magdalena for this concert, accompanying both the music of Hildegard and the new work by Meghan Bunce, and perhaps throwing in a few surprises. Please join Schola Magdalena for this celebration of beautiful new works and the great medieval music that has inspired them.